At Ashton at The Beach it is our mission to design, build, and maintain the most unique and beautiful Outdoor Spaces and Custom In ground Swimming Pools for our clients, while consistently exceeding their vision and expectations, all the while displaying professionalism, absolute honesty, and superior quality since 2003. Transforming your outdoor living space from “ordinary” to “extraordinary” is what we strive for. It requires a keen attention to detail, and constant communication, from start to finish. That just happens to be our specialty, which is why you’ll get not only a beautiful outdoor space or swimming pool oasis, but an exciting and memorable experience. At Ashton at The Beach we specialize in pergolas, paver patios, design, decks, fire & water features, new pools and pool remodeling, outdoor kitchens and custom landscape design and installation. To this date we have has completed over one thousand custom projects in making Lewes Delaware, Rehoboth Beach Delaware, Millsboro Delaware, Bethany Beach Delaware, Dewey Beach Delaware, Ocean View Delaware, Millville Delaware, Fenwick Delaware, Selbyville Delaware, Milford Delaware, Milton Delaware, Ocean City MD, Berlin MD and surrounding areas the first choice for Outdoor Living and Swimming Pool Installations. Our experienced team of licensed and insured hardscape and pool designers, architects, and friendly staff are here to offer you the best in customer service, construction and design. We work tirelessly to provide you with the fastest and most pleasant experience while constructing your dream oasis, with one main goal in mind; Functionality, enjoyment, comfort and beauty for your next outdoor living or swimming pool project. Sparkle Pools was formed in 1988 by Raymond H. Glaeser, Jr. and was incorporated in 1994. Since 1988, Sparkle Pools has been serving Maryland and Delaware out of its Denton location, offering installation and maintenance of high-quality inground and above ground swimming pools. To better serve our customers, in 2011 Sparkle Pools added new locations in Dover, DE and Easton, MD. To continue our growth and expand our service area, a location in Chestertown, MD was added in 2013, and in 2014 the new Smyrna, DE location was opened. Over the last 27 years, Sparkle Pools has completed over 2,000 residential swimming pool projects and is the exclusive dealer for Marquis Spas on the Maryland Eastern Shore and all three counties in Delaware. With its staff having over 300 years of combined experience, Sparkle Pools not only believes, but has proven, that customer satisfaction and building strong community relationships leads to continued success. USA POOLS is an inground gunite swimming pool builder and service provider. We are located in Avalon, NJ and have been family owned and operated since 1989. Our mission is to provide our customers with exceptional service and a hassle free building experience. We pride ourselves on "thinking outside the box" to create beautiful pools on any budget. Carter Aquatics is a custom pool building and renovation company specializing in shotcrete pools operating out of Lewes, Delaware. Owned by Laurie Carter, Carter Aquatics has been building dream pools and breathing new life into rundown and well worn pools since June 2015. Using state of the art technology, Carter Aquatics will guide you through the process of building your custom pool from design to filling it with water. Our designers and builders work closely with you the customers to ensure you get exactly what you want out of your outdoor space. Carter Aquatics also offers pool & spa consulting and pool & spa inspections for real estate. You can expect us to provide you with exemplary customer service and high quality products during the installation of your New Jersey pool. We strive to provide all our customers with the most reasonable prices and get our jobs done as scheduled, which is why we have so many referrals. Our company will provide you with a New Jersey pool that you and your family will be satisfied with for years to come. After our installations are complete, you will have all the necessary information and equipment to immediately begin enjoying your pool. Swim-Mor Pools and Spas is a family owned and operated company started in 1967. We specialize in new concrete (gunite) pool construction as well as existing pool renovations and modernizations. We have 3 retail and sales locations covering all of Southern and Central New Jersey as well as New Castle County Delaware. Swim-Mor Pools specializes in custom in-pool spas designs in addition to our various pool options. Besides being a nice place to cool off, a spa with a colorful backsplash or water feature can add much-needed visual interest to your yard. In 1998 two brothers from a large local family recognized the need for a reliable, high quality full service landscaping company on Long Beach Island, NJ. Jeffrey, the consummate worker, with already over fifteen years experience landscaping on Long Beach Island joined Josh, the entrepreneur, already engaged in his third business before his twenty first birthday. Jeffrey and Josh ventured together to found Kline Brothers Landscaping committed to providing the LBI region with skilled workmanship and outstanding service at an affordable price. Within ten years Kline Brothers expanded their expertise by perfecting the art of installing fiberglass pools and spas through Kline Brothers Pool and Spa in Ship Bottom, opened Kline Brothers Landscaping Center, a full service landscaping supply and garden center on Bay Avenue in Manahawkin and grew to become one of largest installers of brick pavers in New Jersey. Even after nearly twenty years of business Kline Brothers still provides all the landscaping needs of the Long Beach Island region. Schedule a free on-site assessment today! SMART POOLS is a family-run swimming pool building company with over 60 years of combined in-ground pool experience. Our name speaks for itself. 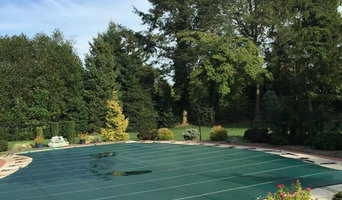 Company's owners are educated in civil engineering and other construction related fields, building and designing inground swimming pools in NJ for over 25 years. Rest assured that we will meet your expectations in building an affordable inground swimming pool. We stay with you every step of the way. We monitor the in-ground swimming pool construction process and ensure that your pool is completed promptly, correctly and precisely to your satisfaction. After all is said and done, we will always be nearby to answer your questions. People say he is the Finest Vinyl-liner Pool builder in South Jersey. Exclusive South Jersey builder of "POLYSTEEL" polyester powder-coated over galvanized steel pool walls for inground vinyl-liner pools. POLYSTEEL is the wall that will not rust or corrode like plain galvanized steel-pool-walls, and will not bow, bend, or crack like polymer-plastic pool-walls.Rich DeMarco has been building pools since 1989 in Camden, Gloucester, Burlington, Salem, Cumberland, Atlantic & Cape May Counties. Call Rich on his cell: 609-313-0300 He has been awarded the APSP CBP-Certified Building Professional national designation by passing the national pool-building exam, years of training seminars, and other necessary qualifications needed for the CPB designation. Pool and Patio Innovations, LLC is owned and operated by Scott V. Henshaw, a life long resident of New Jersey. Scott is by far no stranger to the swimming pool industry. Born into the business, he has had job-site experience since early childhood and management expectations soon after. Scott is a third generation pool installer. While attending college in Pennsylvania, Scott wanted to stay involved in the swimming pool construction industry. He worked at Superior Pools and Spas in Wilkes-Barre, PA. Scott graduated from Wilkes University with a Bachelors in Business Administration in 2002. From 2002-2004 he worked on getting a graduate degree while coaching the Wilkes University Colonels Wrestling Team. In 2004 Scott graduated with a Masters in Business Administration. In February 2005, Scott Henshaw completed the formation of Pool and Patio Innovations, LLC. We are a fully licensed and registered business serving all of southern New Jersey. Education is still a strong objective for our company. We make it a point to attend the annual Atlantic City Pool & Spa Show to stay current on all industry standards and regulations. We go to all possible classes and seminars to obtain knowledge that we can then pass on to our customers. In addition to the Pool and Spa Show, we also attend several other trade shows throughout the year to expand on our expertise in all aspects of the business. Our company certifications include: Interlocking Concrete Pavement Institute, CERTIFIED INSTALLER. Professional Concrete Pavingstone Contractor of Cambridge Pavement Systems Certificate for Installing Vinyl Liner Inground Pools Member of an Expert Panel on Inground Vinyl Liner Challenges S R Smith Diving Board Installation Certification Certificate for Safety Cover Installation Certified Suction Entrapment Prevention and Hydraulic Design Issues We are happy to offer the experience and professionalism that you deserve. We look forward to serving you on your next backyard project. If you’ve been dreaming of relaxing summer days spent poolside, it may be time to consider hiring a Stone Harbor pool builder. A professional can not only help with design and pool installation, but also aid in appropriate maintenance once it’s complete. Whether you're at the beginning stages of planning or want to revamp your existing pool, a pool company in Stone Harbor, NJ will be able to get you on the right track. What exactly do Stone Harbor pool builders do? If you are planning for a new pool in Stone Harbor, NJ, a swimming pool builder will analyze your outdoor space and your aesthetic wishes to determine an appropriate design for your yard, installing it once the plan is developed and approved. Once installed, some pool companies in Stone Harbor, NJ can handle the necessary cleanings, water testing, renovations and equipment replacement or repairs for your pool or spa. If not, many can also suggest Stone Harbor, NJ swimming pool contractors or maintenance services to help with upkeep or repairs down the road. Here are some related professionals and vendors to complement the work of swimming pool builders: Garden & Landscape Supplies, Landscape Architects & Landscape Designers, General Contractors, Landscape Contractors, Solar Energy Contractors. Before hiring a swimming pool construction company to create your new Stone Harbor, NJ pool, determine how you'll be using it. Will it be for fun or for lap exercise? Will the primary users be children, adults or a mix of the two? Knowing the use can help you find Stone Harbor pool builders who shares your aesthetic. Once you find swimming pool builders in Stone Harbor, NJ who share your style, research is critical. Review customer references and comments, collect at least three to four estimates to compare, meet with potential Stone Harbor pool designers and builders in person and ensure that they are New Jersey certified service professionals and licensed with the registrar of contractors before making any final decisions. In addition, get a sense whether they plan to complete the pool installation and be done with it, or whether they seem interested in building a long-term relationship with you. Be wary of the former: it's likely a reflection on the level of quality of the pool construction they do. Find a Stone Harbor pool contractor or designer on Houzz. 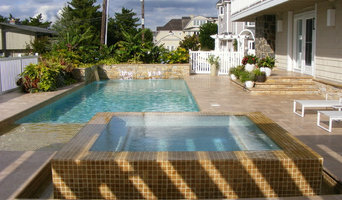 Narrow your search in the Professionals section of the website to pool builders in Stone Harbor, NJ. You can also look through Stone Harbor, NJ photos by style to find a pool or spa you like, then contact the local pool company who designed it.